Mia Goros is a twenty-something year-old girl living in Los Angeles that simply loves learning how to live and feel well. 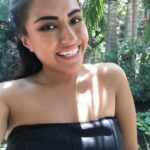 She is passionate about sharing techniques, tools, stories and ideas to help other young women gain clarity, confidence, and enjoyment in their lives on her website. When she’s not working, she’s either planning her next trip or trying a new restaurant around town.